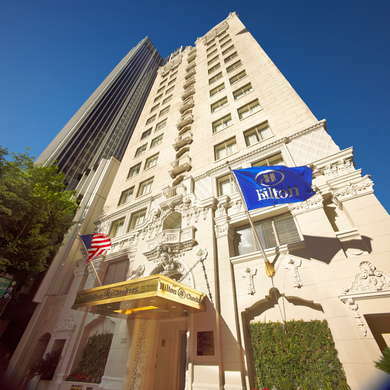 Situated in the heart of the Financial District in Downtown LA, Hilton Checkers complements its surroundings with a Spanish-style façade on a building constructed in 1927. Fully renovated since then (multiple times), the hotel is home to Wall Street wannabes and tourists who either love downtown architecture or just want to be close to Downtown’s endless food, drink, and entertainment options. Make sure you ask for a room on the upper floors (there are 13, but because of archaic superstitions, people still won’t list that number). But, dumb legends aside, the top floors feature incredible views of the downtown skyline, which is nothing short of magical at night. In-room amenities include free coffee, but unless you’re a Hilton Rewards Member, the freebies stop there. YOU SHOULD KNOW Unfortunately, there aren’t any balconies in the rooms, but the more unfortunate thing is that there is no liquor in the mini bars--c’mon, Hilton! 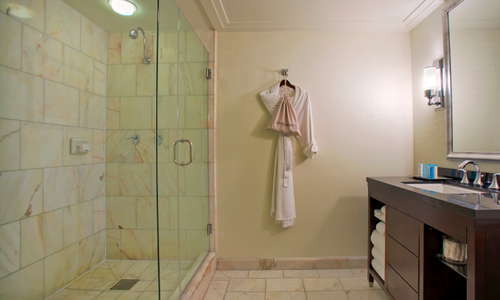 Bathrooms are decked out with white marble floors, black countertops, and shower/tub combos. 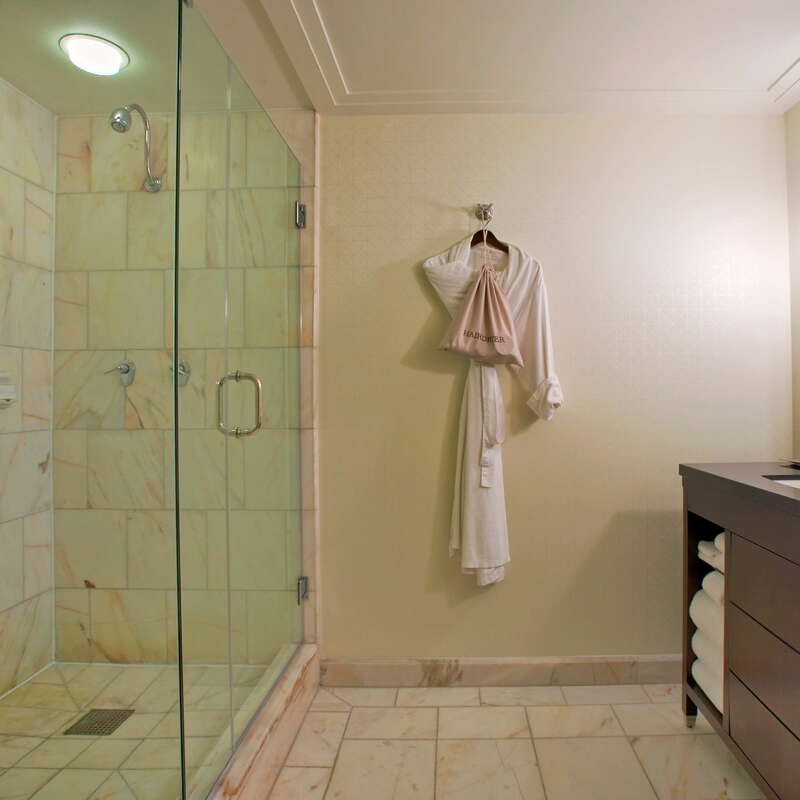 Hilton lovers will recognize the Peter Thomas Roth bath products, and mirror lovers will recognize themselves in the the giant floor to ceiling ones they’ve got inside. A staid lobby bathed in beiges and grays gives way to a fairly bustling bar that opens around 3 p.m. Guests can while away on comfy lounge furniture, or take up a game of chess or checkers on a dedicated table in the corner. While many sites (including their own) hint at a pool on the property, there’s just a hot tub on their rooftop deck. Take a loved one up here while the sun sets. There’s nothing like the views of Downtown LA when the skies get dark and the buildings light up. It’s not a romantic hotel, but this spot begs to differ. A 24/7 gym features Precor treadmills and cardio machines. There are also free weights for the heartier workout types. Checkers Restaurant features California cuisine with some Asian influences for breakfast, lunch, and dinner. On nice days (all the days in LA), take your meal outside on their terrace. The Checkers Bar is off the lobby and offers comfy seating, sports on the TV, and the occasional drink special. 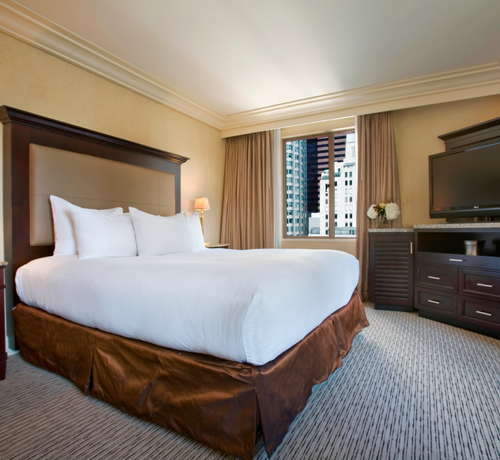 Though the hotel resides in the Financial District of Downtown LA, that doesn’t mean you’re not close to great restaurants, bars, and attractions all within walking distance. Feel free to walk in this area as you’re very centrally located in Downtown. If you want to get out a bit farther (Chinatown, Little Tokyo, Arts District, etc.) it’s worth catching an Uber or Lyft (there are many). Getting to the rest of the city is easy as well with two metro stops within a 5-minute walk from the hotel. Breakfast and lunch fiends on the go should head to Grand Central Market (10-minute walk) where local vendors dish out everything from the best lox in the city to vegan ramen. For dinner, head over to Perch (5-minute walk) and revel in the rooftop views, great drinks, and French cuisine. Whiskey-philes can’t go wrong with an unbeatable selection at Seven Grand (5-minute walk). For something more casual, check out Casey’s Irish Pub (3-minute walk) with flowing Guinness and Irish specialties. 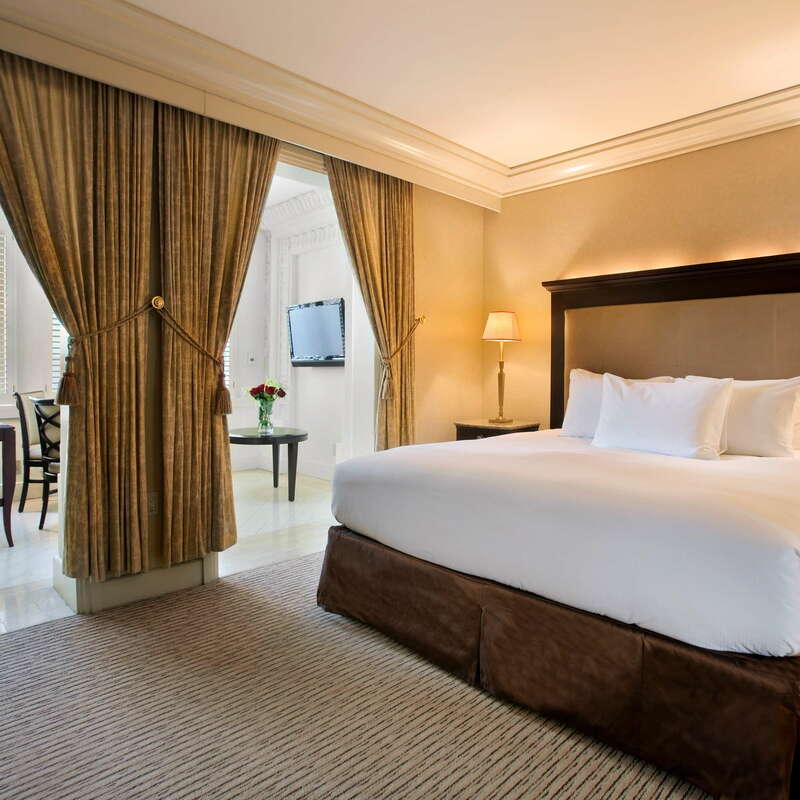 Location is arguably the reason to stay at this Hilton property. While the hotel’s façade and history harken back to LA’s roaring 20s, there’s little inside to reminisce about. But being centrally located has its benefits. 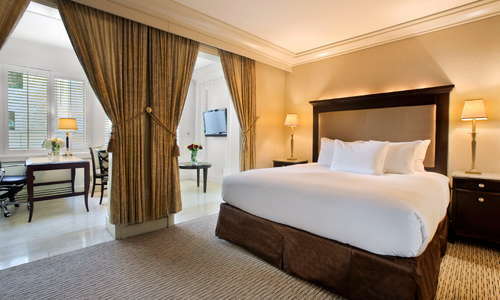 Within walking distance are some of the city’s finest bars, restaurants, museums, and theaters. And don’t forget to check out the roof deck--it’s worth going up there for a drink or three and bathing in the lights of LA.